President Trump spoke to reporters on Dec. 17 after special counsel Robert S. Mueller III obtained emails from President Trump’s transition team. President Trump on Sunday sought to douse speculation that he may fire special counsel Robert S. Mueller III amid an intensifying campaign by Trump allies to attack the wide-ranging Russia investigation as improper and politically motivated. Returning to the White House from Camp David, Trump was asked Sunday whether he intended to fire Mueller. "No, I'm not," he told journalists, insisting that there was "no collusion whatsoever" between his campaign and Russia. The president's comments came a day after a lawyer representing Trump's transition team accused Mueller of wrongfully obtaining thousands of emails sent and received by Trump officials before the start of his administration — a legal and public relations maneuver seen as possibly laying the groundwork to oust the special counsel. Trump criticized Mueller for gaining access to those emails, telling reporters the situation was "not looking good." "It's quite sad to see that," Trump said. "My people were very upset about it." Mueller's spokesman denied wrongdoing, and some legal experts questioned the claim that the emails were improperly obtained. The outcry over Mueller's investigation into Russia's 2016 election interference grew louder over the weekend among Trump loyalists and conservative media figures. Although Trump has publicly and privately criticized the Department of Justice and the FBI and voiced displeasure with his appointees there, the president's advisers insisted he is not aiming his ire at Mueller. "As the White House has repeatedly and emphatically said for months, there is no consideration about firing or replacing the special counsel with whom the White House has fully cooperated in order to permit a fully vetted yet prompt conclusion," Ty Cobb, a White House lawyer overseeing the Russia matter, said Sunday in a statement. Trump's lawyers, who have been assuring the president that Mueller's investigation is poised to wrap up by January or so, are scheduled to meet with Mueller's team this week for a routine status conference. They are expected to ask the special counsel if there are any other outstanding questions or materials that investigators need before concluding the probe. As the special counsel has inched closer to Trump with a series of indictments and guilty pleas, including securing the cooperation of former national security adviser Michael Flynn, the president's defenders have spotlighted examples of political bias among two senior FBI officials as proof of a compromised investigation. FBI lawyer Lisa Page and counterintelligence agent Peter Strzok worked on the Russia investigation. Strzok was removed from Mueller's team in July after text messages were discovered in which they discussed their dislike of Trump and support of Democrat Hillary Clinton; Page had left the team two weeks earlier for what officials said were unrelated reasons. Their text messages were released by the Justice Department last week and are still under review. 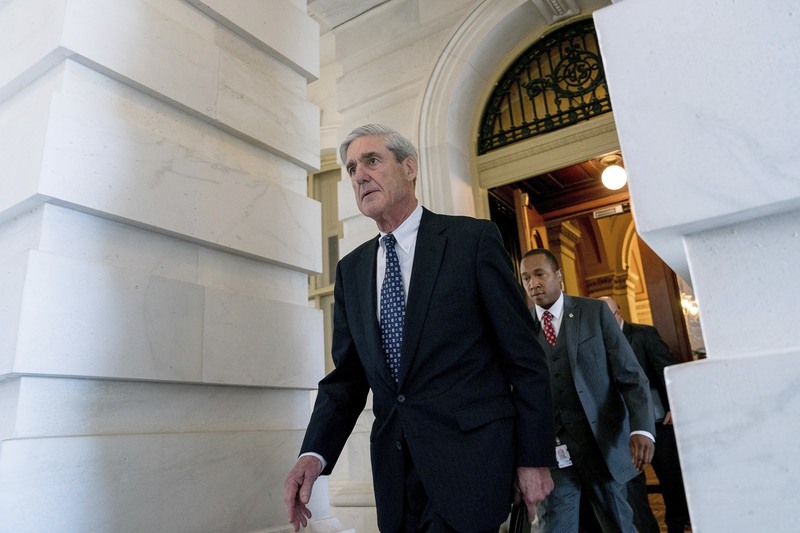 A former top FBI official assigned to special counsel Robert Mueller’s Russia probe was taken off that job this past summer after his bosses discovered he and another member of Mueller’s team had exchanged politically charged texts. Some Trump surrogates have said the texts show that Mueller's investigation is partisan. "It looks more and more and more like an attack on the presidency," former Trump campaign adviser Michael Caputo said Sunday. "I still don't believe Mueller is in for a silent coup, but I think people around him have shown that this thing is off the rails. . . . These texts and emails were a declaration of their membership in the resistance." The attacks have fed speculation about Mueller's fate. Rep. Jackie Speier (D-Calif.) told a California television station on Friday that "the rumor" on Capitol Hill was that Trump would fire Mueller at the end of this week, as Congress disperses for a holiday break. Liberal activist groups have readied mass protests in the event that Mueller is fired. The sprawling "Trump Is Not Above the Law" coalition says it has more than 400 demonstrations ready to launch nationwide. Were Mueller to be fired in the morning, events would be held at 5 p.m. local time; if he were fired in the afternoon or evening, protests would kick off at noon the following day. Trump's aides said the rumors are nonsense. Asked whether the Trump transition team lawyer's complaint was setting the stage for firing Mueller, Marc Short, the White House legislative affairs director, replied, "No!" "There is no conversation about that whatsoever in the White House," Short said Sunday on NBC's "Meet the Press." Treasury Secretary Steven Mnuchin said Sunday on CNN's "State of the Union" that Trump did not mention firing the special counsel when they had dinner Saturday night. "I don't have any reason to think that the president is going to do that, but that's obviously up to him," he said. Advisers who have spoken recently with Trump about the Russia investigation said the president was sharply critical of Attorney General Jeff Sessions, as well as Deputy Attorney General Rod J. Rosenstein, who oversees the Mueller operation — but did not broach the idea of firing Mueller. "I think he realizes that would be a step too far," said one adviser, who spoke on the condition of anonymity to share a private conversation. Rather, Trump appeared to be contemplating changes in the Justice Department's leadership. In recent discussions, two advisers said, Trump has called the attorney general "weak," and complained that Rosenstein has shown insufficient accountability on the special counsel's work. A senior official said Trump mocked Rosenstein's recent testimony on Capitol Hill, saying he looked weak and unable to answer questions. Trump has ranted about Rosenstein as "a Democrat," one of these advisers said, and characterized him as a threat to his presidency. In fact, Rosenstein is a Republican. In 2005, President George W. Bush nominated him to be U.S. attorney in Maryland. On Monday morning, after this story was published, a White House spokesman reached out to The Washington Post to say that Sessions and Rosenstein are safe in their jobs. "The president is not considering changes to the Department of Justice leadership," said Raj Shah, principal deputy White House press secretary. Trump has watched Fox News Channel segments attacking Mueller's investigation, advisers said, including those by Jeanine Pirro, a former judge and prosecutor whose show is a Trump favorite and who has visited with the president in the White House. On her Saturday night broadcast, Pirro railed against Strzok and Page, as well as Deputy FBI Director Andrew McCabe. "The only thing that remains is whether we have the fortitude to not just fire these people immediately, but to take them out in cuffs," Pirro said. Christopher Ruddy, a Trump friend and chief executive of Newsmax, distinguished between Trump's belief that the probe is politically motivated and his assessment of Mueller's performance. "I don't think he personally blames Mueller," said Ruddy, who said he discussed the issue recently with the president. "I just think he sees the whole probe as political from the get-go and unwarranted. In my mind, I think Mueller is 0 for 4 so far: Two indictments and two plea agreements, and there's no evidence of Russian collusion in any of them." Senior law enforcement officials have been worried for months that they would face intensifying criticism once Strzok and Page's communications became public. Since the revelations, some conservatives have called for the appointment of a second special counsel to investigate the FBI — a move that could cause significant headaches for Mueller because FBI agents have performed so much of the investigation. "This bias is like an infection," Rep. Matt Gaetz (R-Fla.) said Friday on Fox Business Network. "It's like an incurable cancer that's inoperable, and we've got to end this Mueller probe." On Saturday, a lawyer representing Trump's transition team claimed in a letter to congressional investigators that Mueller's team improperly obtained a trove of transition emails from the federal General Services Administration. The letter from Kory Langhofer, counsel to Trump for America, alleged that career GSA employees improperly provided privileged communications to investigators working for Mueller, contending that transition documents are private property and not public records. The special counsel's office rejected the allegations. "When we have obtained emails in the course of our ongoing criminal investigation, we have secured either the account owner's consent or appropriate criminal process," said Peter Carr, a spokesman for Mueller's team. Some legal experts challenged Langhofer's charge. Randall Eliason, a former federal prosecutor who teaches a course on white-collar crime at George Washington University Law School, said it was not surprising that Mueller's team sought Trump transition emails. "It's not your personal email," Eliason said. "If it ends in .gov, you don't have any expectation of privacy." If Trump's team had a valid legal claim, Eliason said, it would follow standard protocol of filing a sealed motion to the judge supervising the grand jury and ask the judge to provide a remedy, such as requiring Mueller's team to return the emails or excluding their use in the investigation. The transition team has not yet been in contact with the grand jury judge, according to an official with knowledge of the legal activities who was not authorized to discuss them for attribution. There are ways that Trump could fire Mueller, according to legal scholars and former Justice Department officials. Under the special counsel regulations, Mueller could be disciplined or removed from office only for "good cause" and "by the personal action of the attorney general." In this case, Rosenstein is acting as the attorney general because Sessions recused himself from the Russia investigation. Rosenstein faced heated questioning from House Judiciary Committee Republicans last week. "We recognize we have employees with political opinions," Rosenstein testified. "It's our responsibility to make sure those opinions do not influence their actions. I believe that Director Mueller understands that, and he is running his office appropriately." Neal Katyal, the former acting solicitor general who wrote the special counsel regulations that govern Mueller's appointment, has said that Trump would have to fire Rosenstein to get rid of Mueller. "If Rosenstein refused, Trump could fire him and keep firing everyone who replaced him until he found someone who would fire Mueller," said Harvard Law School professor Jack Goldsmith, former head of the Justice Department's Office of Legal Counsel and co-founder of the Lawfare blog. If Trump fires Rosenstein, the next in line to oversee the special counsel is Associate Attorney General Rachel Brand, the third-ranking official in the Justice Department. On Capitol Hill, Mueller has widespread support, even among Trump's allies. Senate Majority Whip John Cornyn (R-Tex.) said Sunday that Mueller should "be concerned about the appearance of conflicts of interest that would undermine the integrity of the investigation" but said he still has confidence in Mueller. Asked what might happen if Trump fired the special counsel, Cornyn said, "I think that would be a mistake." Devlin Barrett, Rosalind S. Helderman, Carol D. Leonnig and David Weigel contributed to this report. Sari Horwitz is a Pulitzer-Prize winning reporter who covers the Justice Department, law enforcement and criminal justice issues for The Washington Post, where she has been a reporter for 34 years.